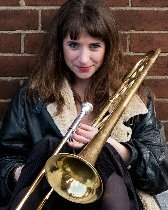 When asked by her little sister for some career advice, Faye realised she'd spent the last half of her 20s trying to make trombone comedy work. Join Faye for an idiosyncratic tale about a South London foster family, why she's decided she wants to become a stepdad and what it's like to be quite often the only woman in the band. Debut hour from Best Newcomer: Musical Comedy Awards 2015, Runner-Up: Bath Comedy New Act 2016, as heard on BBC Radio 2/4extra.